Millie’s Pizza has always been a strong supporter of STEM (Science, Technology, Engineering & Math) within our public school systems. Since 2008 we have donated over a thousand personal pizzas to elementary students who showed improved progress in mathematics through our Millie’s Math program. If you are an educator and would like to participate in our program please feel free to contact us. It is a great way for us to give back to our community. In July of 2015 Millie’s Pizza made a big step toward going green and reducing our carbon footprint by the installation of an 11KW solar panel array. We have a total of 37 305watt solar panels that produce approximately 2/3rds of our electrical needs. This was made possible through a USDA Reap Grant. Since 2005 we have also made bio-diesel from our used fry oil. We strongly believe that good stewardship is our responsibility to ensure a bright future for our children and generations to come. …Not quite yet. But it is on the horizon. Current FAA laws and regulations prohibit the use of drones for commercial services which includes us here at Millie’s Pizza. We will not be delivering nor have we ever delivered our delicious food to a customer through the US air space without first meeting all requirements set forth by the FAA, State and Local laws and regulations. Millie’s Pizza will never violate or infringe upon a person’s right to privacy or put their safety at risk. 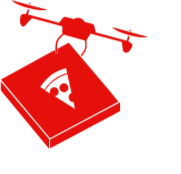 Since early 2011 we have been capable of delivering our food via drone in the sense of flying it from point A to point B thanks in large part to some open source flight controller communities. It is our intent to help bring this technology to the public and to our customers in a safe and non-offensive manner. I have been safely flying RC (remote controlled) aircraft as a hobby for over a decade and I have found it to be very rewarding to share what I have learned with family and friends. If you are interested in learning more about this technology, the RC hobby, FAA rules and regulations or just want a slice of great pizza then please stop in to see us anytime during our business hours.